OURAY COUNTY, Colo. — The Colorado Department of Transportation is installing a new underpass on the Western Slope, but it’s not for drivers, it’s for wildlife.The tunnel is being installed on U.S. 550 north of Ridgway in Ouray County.Wildlife-vehicle collisions have accounted for as much as 40 percent of all accidents along this stretch, CDOT said on its Facebook page. Photo credit: CDOT. 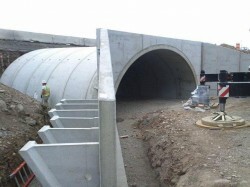 This is a wildlife underpass under construction on US 550 north of Ridgeway. In addition to the underpass, crews are installing other features like special fencing and ramps to keep animals off the highway.CDOT said once they put up the fencing, blocking an animal’s ability to directly cross the highway, they will look for other paths and come across the underpass.”The underpass is tall enough for large animals to use comfortably, and we also make sure there is plenty of sight distance so the animals don’t think they are walking into a trap on the other side,” CDOT said. The state’s first wildlife overpass is being planned for S.H. 9 between Silverthorne and Kremmling.